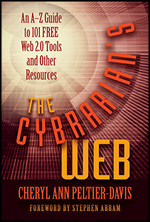 The Cybrarian's Web, by Cheryl Ann Peltier-Davis | Information Today, Inc.
"A great starting point for learning about Web 2.0 tools that can be used to innovate and improve library services. The 101 evaluations presented in The Cybrarian's Web will help librarians gain a better understanding of social software and the many ways to use it in a library setting. A must-read for any information professional who cares about online collaboration and sharing among users." You'll discover dozens of lesser-known resources and learn exciting new ways to use many of the most popular sites and tools. With all this and a supporting webpage, The Cybrarian's Web is a winner! "This book belongs on every library innovator's bookshelf. This isn't just for the techies and, indeed, it would be a shame to limit its use to techies. Web 2.0 is first and foremost about the end-user experience and, so, for every reference librarian, trainer, director, web content writer, blogger and library leader, review the opportunities in this guide as part of your strategic planning process. You'll be glad you did!" "Several colleagues of mine like to play this game where they try to point out an online resource to me before I've already found it myself. Had they read The Cybrarian's Web before me, they'd be able to win that game for a while. Even after 15 years of experience with internet tools and resources, every few pages I learned something new and by the end had added many new tools to my online arsenal." "This amazing resource has a little something for everyone—a must-have guide for all librarians!"